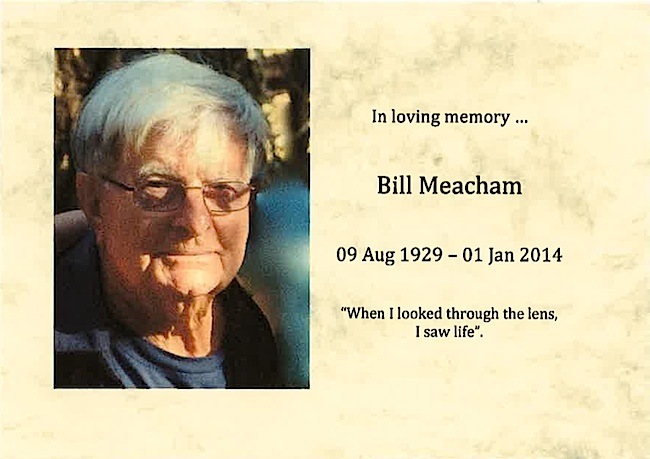 We sadly and belatedly report the passing of former Seven Perth senior News and documentary cameramen Bill Meacham in January of 2014. 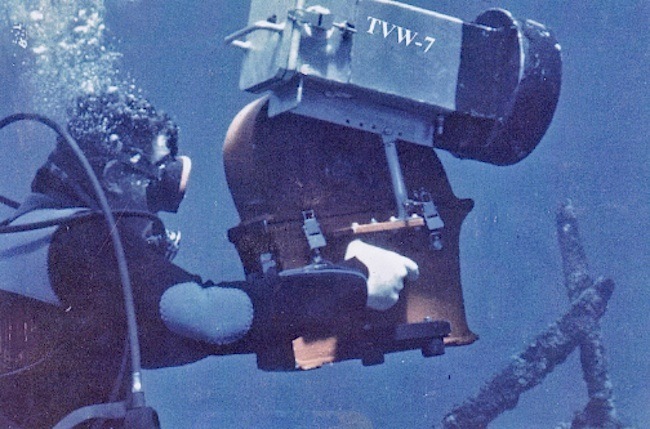 Bill was the last survivor of a generation of TVW cameramen that included Digby Milner, Tom Hall, Lu Belci, Stan Jeffery, Matt Williams and Peter Makowski. 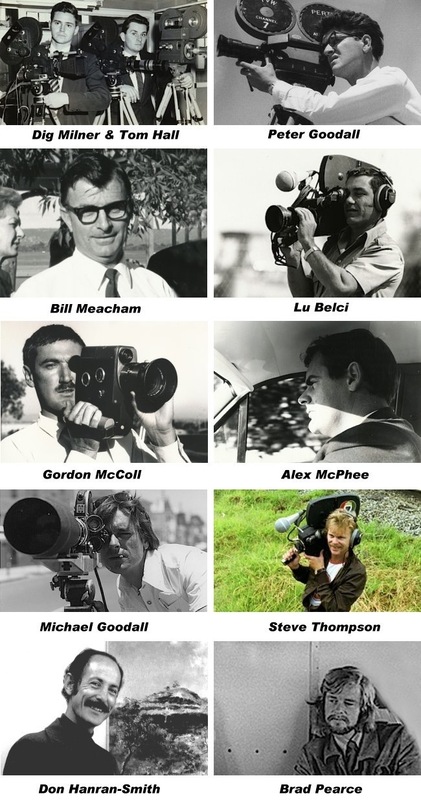 Other noted cameramen of the era included Peter Goodall, Don Hanran-Smith, Alex McPhee, Brad Pearce, Steve Thompson, Roger Dowling, Michael Goodall, Gordon McColl, Ian McLean and Westley Ashton. Bill was born at the beginning of the Great Depression, which was brought about by The Wall Street Crash of 1929. This presented the world with with years of gloom and hardship that continued until the industrial effort for World War II lifted the economy out of the doldrums. The war lasted from 1939 till 1945. 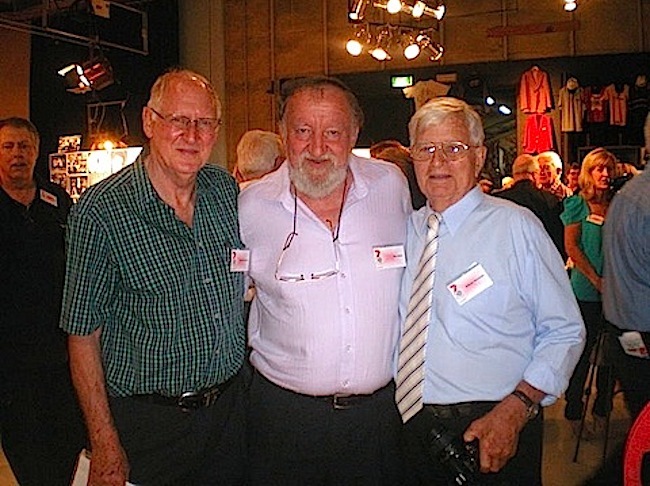 The circumstances of that era moulded the character of those who lived through it, for Bill had strict upbringing with his teenage years spent working for his father in the family bakery in Rockhampton. Bill’s son Michael has kindly provided a eulogy that highlights various aspects of his life and his great passion that also become his career. For he was known for never being without a camera in his teens. 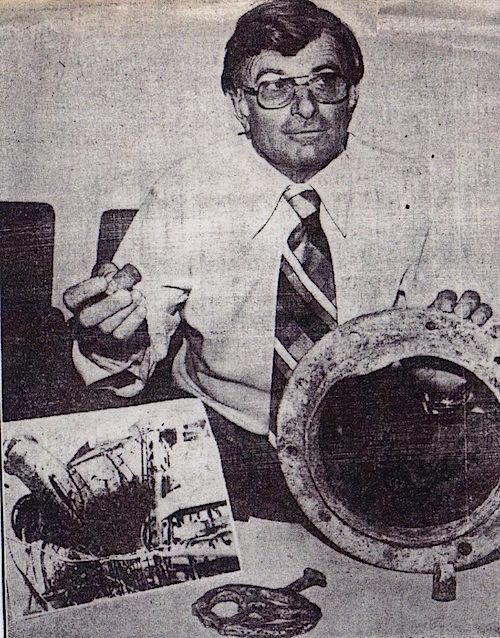 Then in 1959, a maritime tragedy involving a capsized barge off the coast of Queensland gave Bill the opportunity to capture the event, which in turn led to a job as a news cameraman in with QTQ Channel 9 in Brisbane. Bill applied to TVW Channel 7 in Perth in 1967 and was appointed head cameraman following interviews by Darcy Farrell, the Seven news editor and Film Manager Bill McKenzie, who travelled to Brisbane to meet with Bill. Bill was recognised for holding high expectation of quality from not only himself but the staff engaged under him. He would say that, “If a job was worth doing, it was worth doing properly”, no matter what it was. It was a career that would send him to film documentaries and stories in all manner of places, with all kinds of people. Please click HERE to read the eulogy that Michael presented at his father’s funeral service. In this presentation, Michael touched on Bill’s business venture with other key colleagues from TVW Channel 7. Keith Mackenzie, John Hudson, Don Rowe and Bill Meacham formed a production company called Threshold in 1979. Their first big project was to travel the world to make a documentary titled: “Fragile Handle with Care”. This program took a look into the future, anticipating what may happen in the 1980’s with regard to society, entertainment, technology and the environment. The next major project was to remake the Maybelline cosmetics commercials for Australia, at a time when regulation prohibited overseas Ad productions from domineering the market. “Bill and I spent many years travelling The World Producing Documentaries for TVW Channel 7, many of which also involved John Hudson as Producer/Interviewer. We later travelled and worked together when “Threshold” was formed. Bill and I grew very close as, apart from sharing Hotel Rooms when travelling (to keep the costs down) we also spent weeks huddled over a Steinbeck Film editing machine as Bill was, on most occasions, also the Film Editor on our Projects. We were basically a 2 Man team when out shooting, also to keep down the costs, where Bill filmed and lit everything, and I Directed and Recorded the Sound and sometimes operated a 2nd Camera. We had quite a few adventures which have already been documented on the Tribute to John Hudson site. Bill and I also worked together on a number of other Projects which were more Light Entertainment style Programmes rather than News Documentaries. “Rolf Was Here” a “Fly on the Wall” Film travelling around the Goldfields with Rolf Harris and also Filming his Concert. “Johnny Cash Special” when we flew Johnny to Kalgoorlie, after his Concert at the WACA Ground, and filmed his visit, to be inserted into his Concert OB Special. We also Filmed Steam Trains and their Grave Yards around the State to be inserted into one of his numbers from the Concert. “Miss Universe” where we filmed a lot of inserts all over WA for the Programme. “The Official Opening of the Mount Whaleback Mine Site for Mount Newman Mining” where we shot the sequence of Events from an explosion at the Mine site then all the way through the processing and transportation of the Ore to when it left on a ship from Port Hedland heading for Japan. Our biggest problem was the Camera continually getting choked up with Ore dust. The above two projects saw us hanging out of Helicopters, with the door off of course, filming The Indian Pacific Train on the Nullarbor and an Iron Ore Train travelling from Mount Newman to Port Hedland. For one shot we sat the Helicopter down on the rails with the Ore Train travelling towards us, we then lifted off at the last minute travelling up and around the very long train in a continuous sequence. I had warned the Train Driver before hand what we were going to do and not to apply the brakes when he saw a Helicopter right in front of him on the railway line. I wish I had a close up of his face as he came towards us wondering if we were going to lift off in time. In those days we didn’t have the luxury of a Ball mounted camera on the outside of the Helicopter with the Cameraman sitting inside. We had to have the door off and Bill had to sit on the floor with his legs out of the side of the Helicopter holding the Camera. Bill was always up for new and unusual shots and contributed so much to the end result, both in the shooting and the editing. We had a very close working relationship and a lot of fun also in our down time on location. There was no easy cost effective satellite program exchange for them to affordably send footage back to Perth, so at the end of the day… Bill and Gary had to take the film and air freight it to TVW Channel 7. 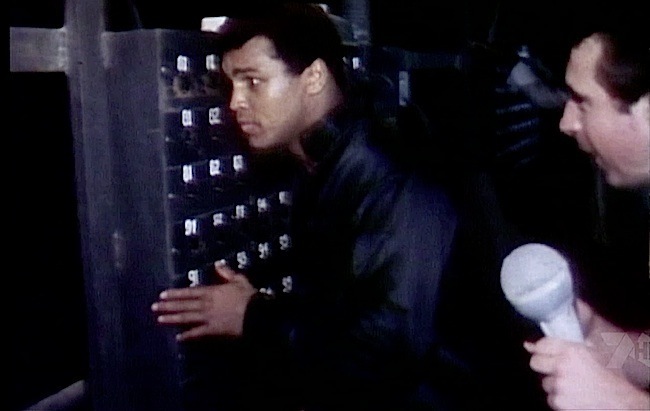 Gary relates the story, “It was by sheer luck and devotion to our jobs that we went a week early to scout out the scene and by being forward was able to set up a meeting to interview the great Muhammad Ali. What a great opportunity and in the process I asked if he would donate his boxing gloves, shorts and boots to Telethon.” Muhammed said, “Do you know how much these would be worth.” I said we could guess but it was for the children and explained about Telethon and how so much money is raised for such a good cause, and Muhammad agreed. In the late 1970s, Bill and Brian Williams remade an early TVW documentary that was titled ‘Baptism of Fire’. This one-hour black and white documentary was produced by Brian and focused on the first-ever naval engagement of the Royal Australian Navy off the Cocos Islands. It was broadcast nationally as part of the Project ’64 series. 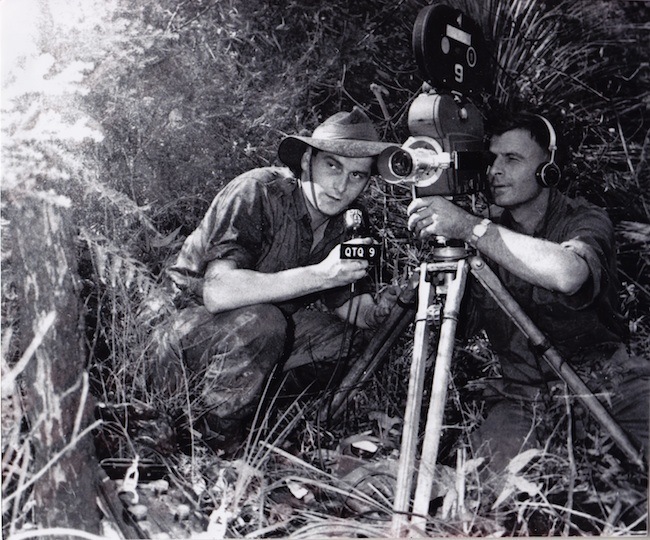 Australian made documentaries were not a feature of commercial television until the Postmaster General Charles Davidson introduced content related provisions in 1960. The ABC had pioneered this field from its earliest days and then in 1961 ‘Four Corners’ became Australia’s first authoritative current affairs program. This program was co-founded by journalist and television producer Robert Raymond (1922-2003) with presenter Michael Charlton, before Raymond accepted an offer from Clyde Packer and Bruce Gyngell to set up a special projects division at Channel Nine (TCN Sydney and GTV Melbourne), which TVW Channel 7 in Perth had a loose affiliation. 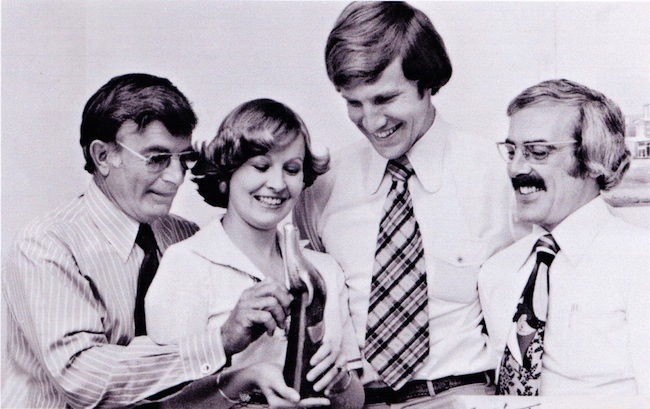 Interestingly, when Sir Frank Packer closed the special projects division in 1968, Raymond established his own company and began making documentaries for the Seven Network. 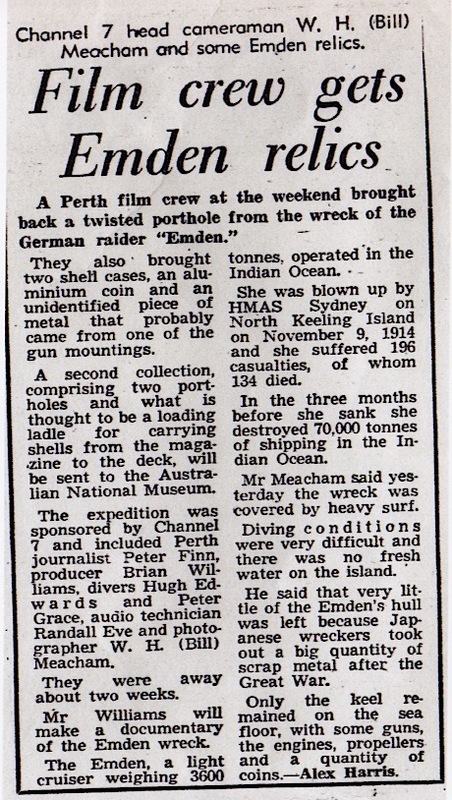 The 1977 colour version of this documentary was called ‘The Cocos Incident’, which further told the story of the German Cruiser Emden and her eventual destruction at the hands of HMAS Sydney on November 9, 1914. 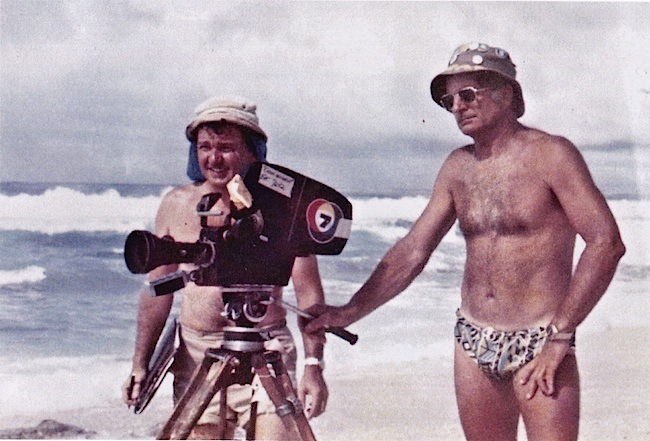 Unlike ‘Baptism of Fire’, Bill and Brian travelled to the site of the naval incident and filmed remnants of the wreck. 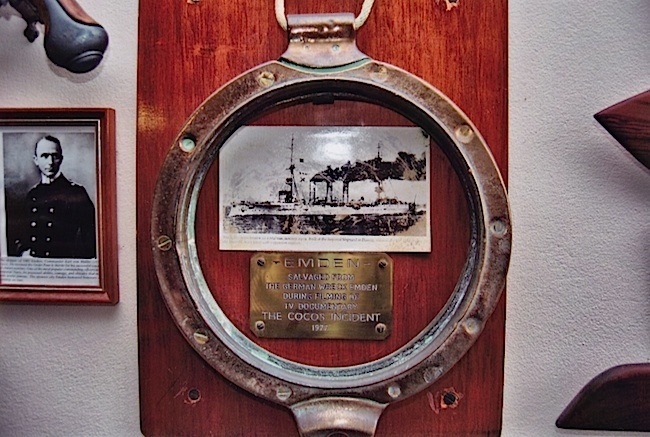 A wall in Bill’s home featured artefacts belonging to the Emden, with the centrepiece being a porthole from this fateful vessel. The TVW presentation team of Sandy Baker and Ian Teasdale won a Sammy Award for Gerry Swift’s ‘What in the World’ children’s education program, filmed by Bill Meacham, which Jeff Newman was instrumental in creating. ‘What In The World’ started in 1973, of which 320 episodes were made until production ceased in 1979. It was sold to 12 TV stations throughout Australia, was shown in Singapore and Kuala Lumpur and won the Sammy award as best children’s series in Australia. Commercial television stations now required to screen ‘C’ classified programming, aimed solely at children aged 6 to 13, every weekday between 4pm and 5pm. Early ‘C’ classified programs on Seven include Stax and Shirl’s Neighbourhood. Commercial stations are also required to screen a minimum of 30 minutes each weekday, prior to 4pm, of programming aimed at pre-school viewers. July 1st 1979: Commercial television stations now required to screen ‘C’ classified programming, aimed solely at children aged 6 to 13, every weekday between 4pm and 5pm. Early ‘C’ classified programs include Simon Townsend’s Wonder World (0-10), Stax (Seven) and Shirl’s Neighbourhood (Seven). Commercial stations are also required to screen a minimum of 30 minutes each weekday, prior to 4.00pm, of programming aimed at pre-school viewers. Margaret O’Brien, a former secretary to Max Bostock, kindly provided these notes about Bill’s funeral, which was held in St Michael’s Abbey Church – a quaint little church / early learning school / museum, all on a huge rustic paddock at the end of dead-end road on the doorstep of the Sunshine Coast, Bribie Island and Brisbane. 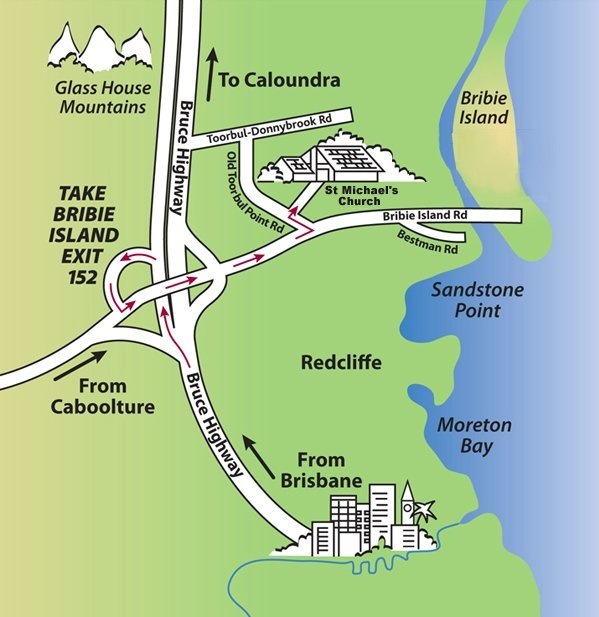 The ¾ hr service was mostly a reflection on Bill’s working life right from how he landed his first job at QTQ-9, Brisbane. Father Tom Strong even told of when he visited him in hospital, Bill was criticising how various commercials on the TV had been shot – the lighting was not right – wrong equipment used etc etc. He also told the story – how a few years ago, Bill criticised him on how he delivered his sermons. He had to focus on the strained glass window above the front door, rather than be looking at his feet (which was when he was thinking about what he would say next). By doing this, Father Tom was told this would draw the congregation in more and his voice would project better!! Many thanks to all who contributed to dad’s tribute. I think that some of you perhaps knew him better than I did. I know that for all the trials and tribulations of work at TVW, these were among his fondest years and entirely due to the character and dedication of so many. My regards to all.